Can I hit the rewind button and go back to my childhood for a minute? I have a bit of museum exploration to do. It turns out, I don’t have to wish this. The entire family can enjoy, pretend, create, explore, learn and play your way across 12+ children’s museums in Michigan. The medley of museums feature interactive exhibits where kids want to linger, playing is encouraged, and learning is a part of the fun. Curious to learn more about space, ships, airplanes, music, nature, science, or something in between? It’s all covered and waiting for you to step inside. Right in our own backyard. The Air Zoo is a popular aerospace and science museum featuring historic planes and spacecraft. Your kids will also love the hands-on science exhibits and indoor rides. Any museum with the title “Hands-on” has our attention. Through interactive activities children can learn about the human body, weather, Michigan nature, traffic lights, magnets, and more. We love the area designated for children under the age of four. 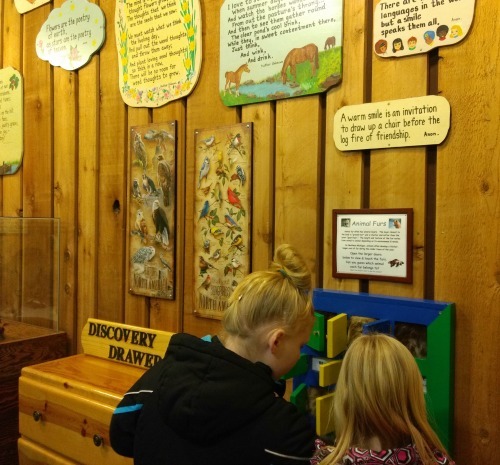 If your kids love learning about animals, the Call of the Wild Museum has over 60 displays of North American Animals in re-creations of their natural habitats. There is also a wildlife theater and hands-on discovery room. Make sure to carve a bit of time out of your visit to St. Joseph for a stop to Curious Kids’ Museum. This museum has a number of fantastic pretend play exhibits – a veterinarian clinic, an apple orchard, a farm. We love the “What If” exhibit – What if you couldn’t walk, hear, or see? Try navigating in a wheelchair or using sign language. This exhibit gives first-hand insight into many common physical challenges. Situated on the coast of Lake Michigan, only a few steps from the Curious Kids’ Museum awaits the Discovery Zone where children can interact with a large water table, climb a lighthouse, rock wall, or play outside on a boat and train. Make sure to try the Whisper Dishes to see how far your whisper voice travels! Popular features at the Forever Curious Museum include a toddler area with playhouse, tool and shopping areas, nature area, bubble table, medical and vet clinic, and activities such as a rock wall and inner tube bouncer. The Grand Rapid’s Children’s Museum has not only the fun permanent exhibits (music making and Legos), but an ongoing rotation of exhibits, so there is always something new to explore. How big of a bubble can you make at the bubble station? Kids can get in the shopping action with the kid-sized grocery store (complete with a ride on Sandy), auto service center, farm, musical station, and toddler area. As your children learn about American history in school, why not take them to see some of that history up close? The Henry Ford offers a staggering amount of historical artifacts and collections. There are also hands-on displays and daily activities for younger kids. Impression 5 Science Center is designed to give kids of all ages a truly hands-on approach to learning using all five senses. Exhibits that you won’t want to miss include Building Zone, Throwing Things, Flow Water Experience, and Michigan Nature area where you can explore the different natural environments of our state. Centrally located in downtown Kalamazoo and with FREE admission, a visit to the KVM is a no-brainer for families. The Burton Henry Upjohn Children’s Landscape section features books, puzzles, puppet station, multiple building stations with blocks, coloring station and more. Keep track of special exhibits at the museum. Kids N’Stuff Museum has a variety of opportunities for pretend-play including being a vet, actor in costume, grocery shopper or clerk, mechanic and more. Other popular exhibits include a water table, art room, bank, and air room. They offer a free day on the fourth Thursday of every month (free admission for guests and extended hours). At Kingman Museum the family can explore wonders of space, natural history, world cultures, and science. Open on weekends, the museum offers free admission. Did you know, Kingman Museum is an official NASA Space Place location? We didn’t. While visiting, make sure to check out a Planetarium show (nominal fee applies). Learn the history of ships on the Great Lakes at the Michigan Maritime Museum. Visit replicas of ships, learn how they are built, or even enjoy an actual boat ride in the summer on a variety of vessels. The Sandcastles museum has something that every kid in your family will love. Some of our favorite exhibits include the airplane, USS Badger replica, and the main street businesses.